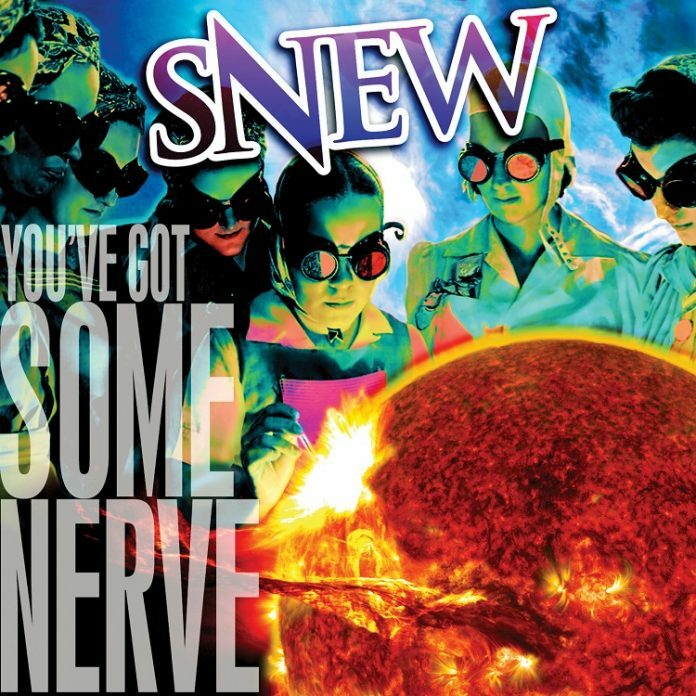 Snew has finally released their highly anticipated new album “You’ve Got Some Nerve.” The band out of Los Angeles continues to be one of the leaders in modern day hard rock/ sleaze rock. Frontman Curtis Don Vito has the perfect vocal prowess for the genre. Andy Lux’s guitar solos are something special. Lux sounds like he makes each solo have an artistic value. Lux isn’t just making noise; he is really making art in a rocking way. Rhythm guitarist Lenny Spickle cranks out the power chords all album long. Mark Ohrenberger is a madman on the skins. Session bassist Paul Ill keeps the low groove thumping. Snew comes out of the gate with a heavy riff for “UR Freaking Me Out.” And new to Snew music is the introduction of a brass section on a couple of songs. (Note: There will be no more horny jokes.) Mark Pender (Bruce Springsteen & Conan O’Brien’s band) on trumpet and Joe Sublett (Rolling Stones & Eric Clapton) on tenor sax blend in on the riffing song. “Holy Hell” is a rock anthem with crisp, sleazy chords ready to fill arenas with a classic headbanger sound. The chorus of “Bring out the choir cuz I want you to yell” will get you singing along with this track. “Acetylene Queen” adds to Snew’s catalog about ladies of significance (“She’s A Real Gunslinger” & “Clever Girl”). This song is hot as a C2H2 welding torch. The funky bridge with a keyboard overlay really propels the song into a Snew classic. “Put Upon” is free-for-all in-your-face rock. Just like the previous track, it has a very catchy bridge. Near the end, it has a Zeppelin-esque sound. “Sharpie” has a nasty as a rattle snake riff. A rattler aka maracas is prominently featured. The brass section comes back into play with an epic ending. On this album, the brass section seems to complement Snew’s meat and potato riffs. “You Tell Me” has a stomping intro. Don Vito gets his growl on in the beginning. The “Hey you..” chorus will get stuck in your head. “Something New Everybody Wants” is perfect for this new Snew album. We all wanted new Snew and that’s exactly what we got. Turn it up to feel the rhythmic pulsations. Don Vito really adds to it with his quick “Give it to me” vocal parts. Lux blazes away with a wah-wah solo. A short jamming drum portion ends the song. That drum part could easily be extended into a killer solo in concert. “Revolution Is A Closed Loop” has a slow burning riff while Ill’s bass is in full force. Parts of the song have a semblance of “Stranglehold” by Ted Nugent. Don Vito ends with an amazing distorted harmonica solo. “You’ve Got Some Nerve” will give your stereo a work out with Spickle’s clean chords. It has an upbeat, cheerful sound that will get your hands clapping along. Lux jumps in and closes with a screaming, string bending solo. There is no negative with this album. The only negative could be that it is only 9 tracks instead of the Snew standard of 10 – because the more Snew the better. Along with this album, it is worth picking up Snew’s other 3 albums to see how they have progressed to this point. Snew continues to have a high value of production while working with famed producer Bobby Owsinski. Hopefully Snew is here to stay and it won’t be another six years until they put out another album. Snew continues to pave the way for this genre.